The Times and The Sunday Times Cheltenham Literature Festival is delighted to announce the Guest Curators for the 2018 instalment of the UK’s oldest literary festival, returning to the heart of Regency Cheltenham for ten extraordinary days of celebration, discussion and debate from 5–14 October 2018. 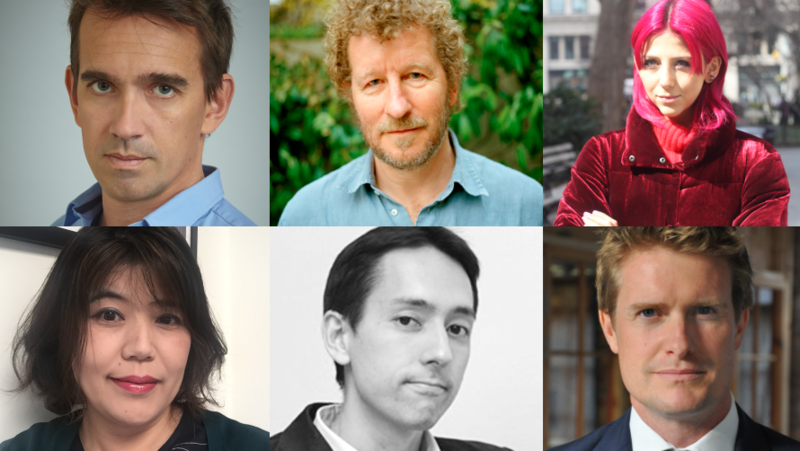 The Guest Curators are: novelist Sebastian Faulks; V&A Director Tristram Hunt; columnist and activist Scarlett Curtis; historian Peter Frankopan; curator, translator and writer David Karashima; and Junko Takekawa, Senior Arts Programmer at The Japan Foundation. With a wealth of expertise to encourage fresh and innovative curation, these six voices are working closely with the literature team, led by Nicola Tuxworth, to advise on the 2018 programme particularly across fiction, a series of events discussing young people’s activism and mental health, and this year’s theme: East Meets West. From the novels of Murakami to the story of the Kimono, the Terracotta Army to the Silk Road, from porcelain to Confucius, sushi to chinoiserie and Pokémon to Studio Ghibli, the theme will explore the culture and history of the Far East, in particular Japan and China. Events woven throughout this year’s programme will examine the unique histories, contemporary societies, belief systems and creative output of these two countries, as well as their relations with each other and with the rest of the world. The Festival’s schools programme has already been announced, complementing a year-round education outreach in Gloucestershire, and will be followed by the first names and family programme on 30 June and the full programme on 17 August. Sebastian Faulks is one of Britain’s foremost novelists, his books ranging from the classic Human Traces (2005) and Birdsong (1993), which is consistently voted one of the nation’s favourite books, through to more light-hearted ventures, such as the Ian Fleming centenary James Bond novel Devil May Care and a tribute to P.G.Wodehouse, Jeeves and the Wedding Bells. Scarlett Curtis is currently contributing editor at Elle UK, writes a weekly column called ‘The Generation Z Hit List’ for The Sunday Times Style magazine, and has written for The Guardian, The Telegraph, Daily Mail and Vogue. In 2017, Scarlett co-founded ‘The Pink Protest’, a feminist activist collective committed to helping young people take action online and in real life. Dr Tristram Hunt is Director of the Victoria and Albert Museum, the world’s leading museum of art, design and performance. Since his appointment in 2017, Dr Hunt has prioritised support for design education in UK schools, expansion of the photography department and encouraging debate around the history of the museum’s global collections. Prior to joining the V&A, Dr Hunt was Labour MP for Stoke-on-Trent Central and Shadow Secretary of State for Education. He is the author of many books including Ten Cities That Made an Empire (2014). Peter Frankopan is Professor of Global History at Oxford University, where he is Director of the Oxford Centre for Byzantine Research and Senior Research Fellow at Worcester College. Frankopan regularly writes for the national and international press. His book, The Silk Roads: A New History of the World (2015) topped the non-fiction charts in the UK, India and China, and is a New York Times Top 10 bestseller. David Karashima is an author, translator and associate professor of creative writing at Waseda University. He has translated into English works by authors such as Hitomi Kanehara, Hisaki Matsuura and Shinji Ishii, and co-edited the Contemporary Japanese Novella Series (Pushkin Press) and Keshiki Series celebrating new voices from Japan (Strangers Press). Karashima’s new book – a work of non-fiction about Haruki Murakami’s English translations – will be published later this year. Junko Takekawa, Senior Arts Programme Officer at The Japan Foundation London, joined Japan’s principal public body for international cultural exchange in 1998. Takekawa is responsible for supervising cultural events delivered by The Japan Foundation London, which aim to encourage UK audiences to create a gateway to Japanese culture or understand more about Japan. This includes the Touring Film Programme, one of the largest touring film programmes in the UK.